Platforms, or the reuse and sharing of architectures, components, manufacturing processes, interfaces and infrastructure across members of a product family is an often leveraged strategy for improving corporate profitability. Platforms are used across a range of industries, from Nokia handsets to Airbus cockpits. The MIT Commonality Study involved 30 firms over 8 years. The study was the first work to uncover that many firms fail to achieve their desired commonality targets, showing weaker investment return on their platform investments. 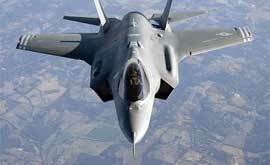 For example, the Joint Strike Fighter, a military aircraft built by Lockheed Martin with 3 variants, has fallen from targeted 80-90% parts commonality in the early 1990s to 30-40% parts commonality currently. 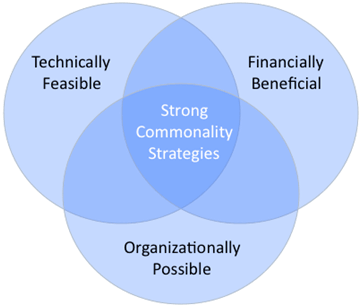 Our work in this area has spanned three areas, shown in the figure below: Identifying technically feasible commonality opportunities, valuing the financial benefits of commonality, and characterizing the organization strategies available for platform managers. Dimensions of strong commonality strategies. In [Boas et al., 2012], we used 7 industrial cases from printing presses to automotive to study the phenomena of divergence. We identified several underlying drivers of divergence, ranging from incorporation of unanticipated technology to failure to understand when optimization decisions within one product create net cost increases when considered across all products on the platform. This study produced recommendations for identifying financially beneficial incidences of commonality, and organizational strategies for rewarding appropriate levels of commonality. A public version of the MIT NASA Commonality Toolkit is available here. The remainder of the publications from the MIT Commonality Study can be found under the Publications pages.